Remember when you were a kid and your mother was always there when you walked out the door to say helpful things like, “Don’t forget your keys. Did you take an umbrella? Do you have your phone?” Truth be told, none of us appreciated all those reminders until we didn’t have them anymore. Now we have to remember all on our own to grab our wallet, keys, phone, and the list goes on. I sometimes find myself patting myself down as I go out the door to make sure the right stuff is in the right pockets. Well, pat down no more. Pitaka has introduced the MagHive to help you remember what stuff you need when. It can even suggest you take an umbrella if the weather looks like it might turn bad. Genius, you say? You are not alone. The MagHive is the darling of this year’s Consumer Electronics Show in Las Vegas. The 2018 Consumer Electronics Show in Las Vegas is the first stop for consumer technology. Here is where the best of the best show off their stuff and people have been gathering to check out the latest and greatest for over 50 years. Last year over 184,000 people attended the gigantic show, along with 4,000 companies from new startups to old familiar faces. There is even an app for your phone to help you navigate the show to take in the best speakers and vendors. There will be celebrity guests like Neil Patrick Harris, Usain Bolt, Norman Reedus, and even Slash will make an appearance at the Gibson Guitar tent. There is literally something for everyone. Amidst all the glitz and glamor, one particular product is getting all the buzz. It’s called the MagHive from Pitaka. MagHive is more than just a single product. It is an entire system to help you get organized and to make sure that when you walk out the door of your home or office that you are ready for whatever the day will bring. Think of the MagHive as your mother standing by the door making sure you have everything you need. Well, maybe that is a bit intimidating. 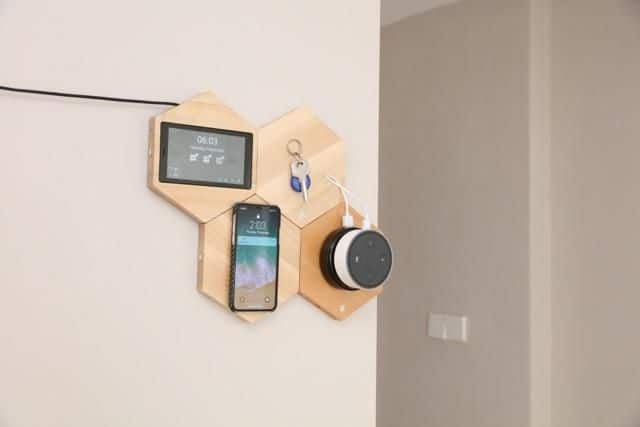 The MagHive system is a modular wall hanging device that you can configure any way you like so you only have the components you need. It is decorative, made of real wood that always looks great. That’s something even Mom could never manage! Its purpose is to keep all your essential items in one place and to remind you of anything you need to remember as you go out the door, including to take your keys! What all can the MagHive do? Here is a little taste. The MagHive can fuel your phone, tablet or other electronic devices. It even works with Echo DOT or Google Home Mini so that you can interface with them as you walk out the door. Your rechargeable device sticks magnetically to the appropriate MagHive module, and as you take them off, the base unit comes to life with any reminders. The MagHive can help you remember any number of things that can you can program through the proprietary app on your phone. Reminders can be tied to regular events such as going to the gym or even taking out the garbage. They can even be tied to weather conditions, so the MagHive will remind you to take an umbrella if there are showers in your area. The MagHive comes to life when you remove an item from its respective module, like when you take down your phone or remove your car keys. Then it lets you know if you have any scheduled reminders or messages. There are even fobs and NFC cards for non-digital devices like keys and even your wallet. Then you can have everything you need to carry in one place. It would be a great add-on to your Home Automation Hub. One of the best features about the MagHive is the way it can interface with your other home management devices, like the Echo DOT or Google Home Mini. These attach via the MagBase, and then you have the advantage of only having to speak your command or reminders and your HMD will make it happen. You can also use the MagBase to free your Echo or Mini from its electronic tether. You can take it with you to another room because it will recharge through the MagBase and function just fine until you stick it back onto its wall-mounted module. With all of these great features, it’s easy to see why the Pitaka MagHive is the darling of this year’s Consumer Electronics Show. Before long, not only will everybody want one, everybody will have one, and we will all live happier, better-organized lives. Vuebell vs Zmodo WiFi Doorbell Comparison: Knock, Knock, Which is Better?